I actually had this whole blog written out, and it was going to be a call to action to get you to the City Council meeting on Thursday, February 27th to support a complete Fulton Street. (Pizza and beer and t-shirts in front of City Hall at 4:00, meeting starts at 5:00.) It was going to be impassioned yet factual and my arguments were so strong that even the trolliest of trolls wouldn’t have a case. But that’s what I’ve been doing a lot of lately. We all have. We’ve researched pedestrian malls so much that we can recite the stats in our sleep. We believe very strongly in the success of the other cities who have seen a turnaround once their ped malls had traffic restored. How could we not? 90% of the cities who have restored their streets have seen significant improvements in occupancy rates. We’ve visited cities that have had very similar situations and seen how beautiful and vibrant their downtowns now are. (Look into Burbank if you get a chance.) We eat, sleep and breathe this project because none of us wants to feel like we’ve overlooked anything. 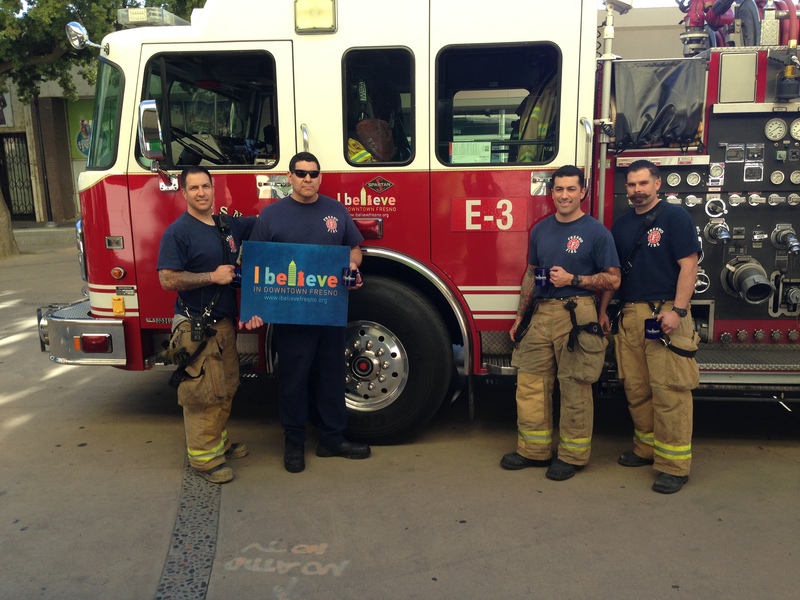 I had a few visitors and we chatted Downtown a bit, I nearly slipped while getting them “I Believe” mugs to match their truck and I knew that my fighting spirit was gone and instead I was in a very giddy, stupid, girlish place. Seriously, what is WITH that? So I deleted everything and decided that today’s Friday Five would be the tension-free “five I Believe photos that make us grin”. 1. 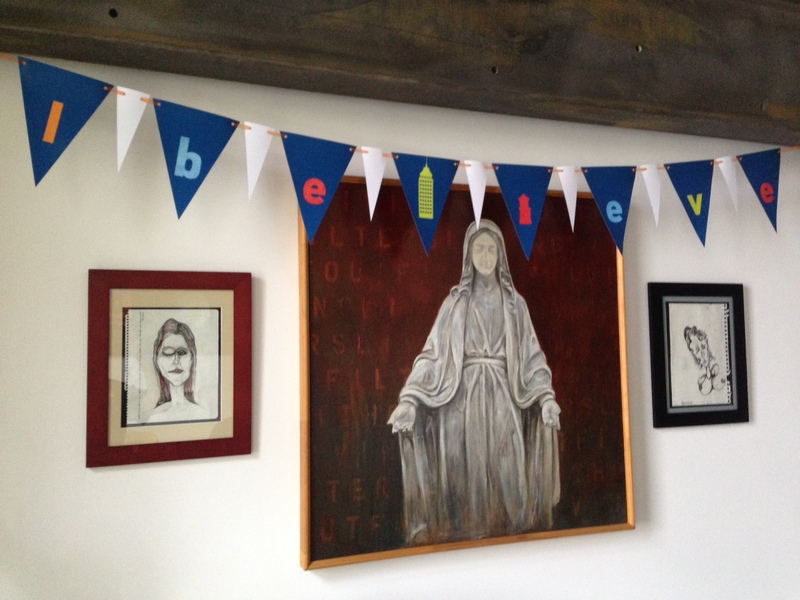 Our super crafty pal Junior at Casual Glitz made a custom I Believe banner for the gathering he hosted. We are still marveling at the creativity! 2. 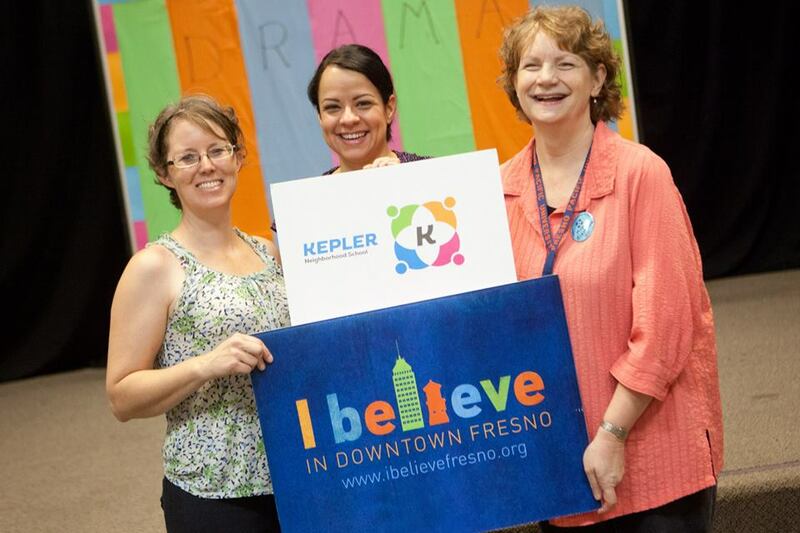 Kepler Neighborhood School administrators believe in downtown so much that they started a charter school right here in the heart of the city! 3. Going wine tasting? 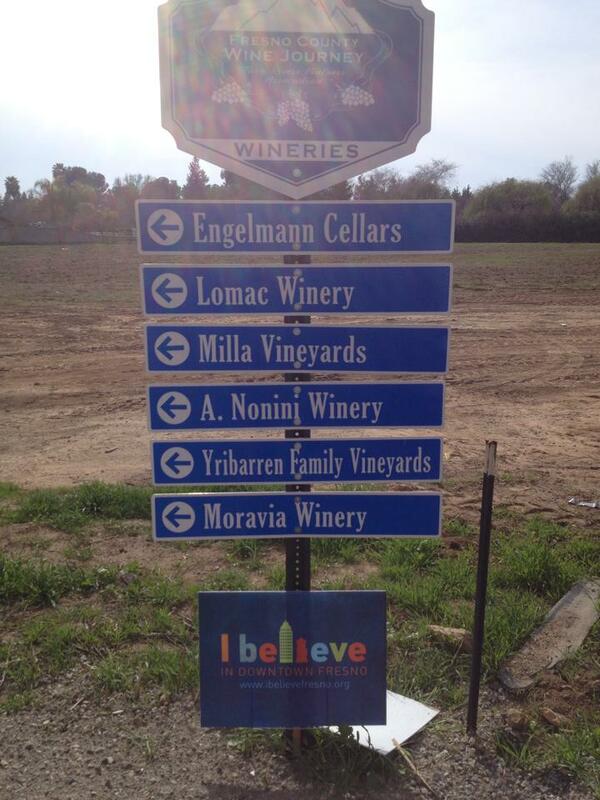 I believe you just might be if you happen upon these signs out at Herndon and 99! 4. Alvaro, owner of Misc Trading Co (home of last night’s Cash Mob) is just the cutest in this photo. It’s almost like we hired a model for it. 5. Okay, shut up, It’s my husband and I. But I HAD to post this after my little flustered-in-the-face-of-firefighters episode this afternoon. 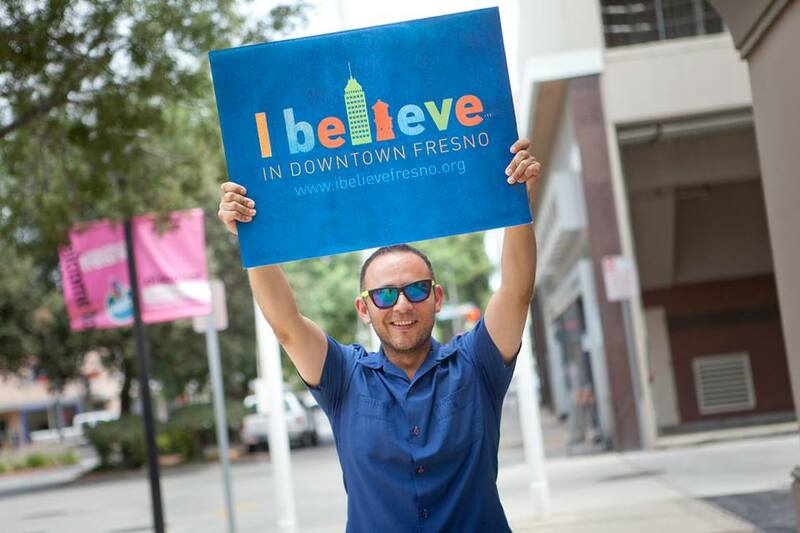 Believing in Downtown and being strong supporters of Fulton Street has definitely been one of the things that keeps us motivated and involved in our community. We want to see this area become a place where our kids are going to just hang out without even questioning it. And when we impose curfew on them, we want to tell them that they wouldn’t have cool places to go if it wasn’t for people like us standing up and saying we want a change! Pompous, yes, but that’s how we Leonard’s roll. I realize that you probably still want some cold hard facts to BAM! hit you in the face, so here is the long awaited research paper compiled by our very own Cole Judge; The Experiment of American Pedestrian Malls: Trends Analysis, Necessary Indicators for Success and Reccomendations for Fresno’s Fulton Mall. If you still have questions after reading this piece, feel free to get in touch with us! Our very first Cash Mob, awwwww!